Sundays at Moosewood Restaurant: Ethnic and Regional Recipes from the Cooks at the Legendary Restaurant – by Moosewood Collective: I first discovered Moosewood cookbooks years ago when I stumbled across my grandpa’s copy of their first one (which I want to get someday). The Moosewood restaurant was started back in the 70s and it is known for its amazing vegetarian cooking. In my teens, I went through a period where I was considering becoming a vegetarian, and while my views on food have definitely changed since then (I love good meat! ), I still really appreciate a good vegetarian cookbook and the Moosewood ones are certainly that. Sundays at Moosewood is over 700 pages of meatless recipes from around the world. Each chapter is devoted to the food of a particular country or region, with some that you don’t ordinarily find in general ethnic cookbooks…like Armenia, Finland and two regions of Africa (south of the Sahara and North Africa/the Northeast African Highlands). If you love to try different ethnic foods, I highly recommend this one! The Dancing Gourmet: Recipes to Keep You on Your Toes! – by Linda Hymes: A cookbook written by a ballerina, my parents got me this one as a birthday gift many years ago. Sprinkled with photos of both ballet dancers and food, this cookbook contains a lot of very sophisticated recipes. My food is usually, shall we say, more rustic, but all the same, it’s a fun book to page through for inspiration. I made her recipe for pizza margherita sauce for several years and it’s still the base for any red sauce that I make. The Easy Way to Artisan Breads & Pastries – by Avner Laskin: I’ve always enjoyed baking bread, and my husband absolutely loves almost any kind of bread, so I was excited when I received this cookbook at one of my bridal showers. Basic bread can get kind of boring after awhile and I wanted to be able to make those crusty and chewy French and Italian loaves that you can buy, but I wasn’t really sure how to exactly go about it. I’ve made a couple of the recipes in here and in general was pretty impressed with the results…it’s exciting when you pull bread you made out of the oven and it looks (and tastes!) like stuff you would get at a nice bakery. However, my only reservation is that, in the few recipes I’ve tried, I’ve already found one major recipe typo (calling for one cup of yeast…and I pretty sure they meant something a lot less than that!). Thankfully, it was a pretty blatant typo so I didn’t follow it, and it could be the only one in the book, but it does make me wonder about the editing and how it has affected the other recipes. However, that aside, I definitely still want to keep trying some of the recipes in this book…especially now that it’s finally cooling off enough to bake! The Irish Pub Cookbook – by Margaret M. Johnson – Knowing my love of pretty much anything having to do with Ireland or the Irish, Aaron found this cookbook at a local used bookstore and bought it for me. And I’ll admit, I haven’t actually made anything from it, though I’ve several times just paged through it to look at the photos of Ireland and read about all the different pubs. Pubs are fascinating places (and to all the American readers, they are very different from “bars” in the States) and Aaron and I really enjoyed the few that we went to during our trip to the UK several years ago. Though honestly, the pubs that the author pulled these recipes from must be a lot fancier than the ones we visited since we never saw food like that! The recipes do look very yummy and maybe I will try making some one day…if I can tear myself away from reading about one of my favourite places on earth! Complete Outdoor Living Cookbook – by Williams-Sonoma: Picked up for a couple dollars at a thrift store, but missing the cover, this is my only Williams-Sonoma cookbook…though I hope it gets some relatives someday! Divided into food categories that are then divided into seasons, I love just paging through this book to look at the photos. There’s a lot of delicious-sounding breakfast ideas in this one and quite a few out of the ordinary picnic dishes. Other than maybe not requiring a whole lot of intensive prep, I’m not really sure how this cookbook is specifically for “outdoor living”, but that’s no matter because the recipes still look and sound scrumptious! Cooking Outside the Box: Easy, Seasonal and Organic: The Abel and Cole Cookbook – by Keith Abel: This is another of my recent acquisitions and such a fun cookbook to read! I first came across it in a Barnes & Noble several years ago (I go there and look through their cookbook section and then come home and add the ones I liked to my Amazon wishlist…they’re always so much cheaper online) and immediately liked how laid-back it was in regard to measuring. Many things are measured by mugfuls, glugs and dashes, which is exactly how I cook! The author is British and he is the one who made CSA-type boxes popular in England…and Abel and Cole is the name of their company. According the author, this cookbook came about as a result of their customers asking for good ways to cook this or that vegetable, and the farmers sharing their favourite recipes. So yes, it’s focused mainly on produce recipes though there are a good many meat recipes too. This cookbook is divided by seasons (spring, fall, summer and winter), as obviously a big part of their company is using seasonal ingredients. Do note though…in regard to the “fun to read” part, this cookbook is full of British humour and British slang, which I greatly enjoy! However, if you’re not familiar with that humour and slang, some of it may be confusing. Also, because it’s written by a British guy, there’s obviously quite a few British food and cooking terms in this book so you may want to brush up on some of those before reading it. Super Natural Cooking – by Heidi Swanson: I’ve followed Heidi Swanson’s cooking blog, 101 Cookbooks, for a long time and have found many yummy recipes on there. When her first cookbook came out several years ago, I was very excited and added it to my wishlist. I ended up receiving a copy at one of my bridal showers and finally got around to reading through it after all the wedding excitement died down and I finally had my own kitchen. One of my favourite parts of her cookbook are all the pictures…she a photographer for a reason. I also love all the different grains she incorporates into her cooking since that’s something I want to do and am not always very good at. Her section on building a natural foods pantry has lots of great information and is very accessible. The Silver Palate Good Times Cookbook – by Julee Rosso and Sheila Lukins: This is an older cookbook (published the year before I was born!) that I discovered through my friend Heather when I lived with her and her family in New Zealand. Heather cooks very similarly to the way that I do (I learned so much from her!) and the fact that this cookbook had a spot in her collection said a lot to me. The French onion soup recipe in here is so good that Aaron remembered it from when he visited me in NZ and it is actually a big reason why I finally bought this cookbook after we were married. I also really appreciate the different food and cooking tidbits scattered throughout the book, most are quite helpful and informative. Jimmy Schmidt’s Cooking Class: Seasonal Recipes from a Chef’s Kitchen – by Jimmy Schmidt: This is another one that was a gift from Aaron’s foodie brother and I’ve found it quite helpful. Like several of my other cookbooks, this one is divided into seasons. In each season part, there are listed 20-30 different ingredients specific to that season, with several pages dedicated to each. Along with a couple of recipes for each ingredient, there are tips on selection and preparation and how to get the most of out of that ingredient. I’ve really liked how each little chapter focuses on just one ingredient because it gives you the base to expand on and get creative with that ingredient after you know what it goes best with and how best to prepare it. Mediterranean: Over 300 Sun-drenched Recipes – by Lorenz Books: Early this past spring, Aaron told me that he would like to start eating more Mediterranean food. Eager to find some good recipes along that line, I ordered this cookbook that had been recommended to me by my friend Heather from NZ. It was a rather hard one to find as it’s British and supposedly out-of-print, but once again, Amazon came through. When it arrived, I had Aaron page through all 512 pages and mark (with little sticky notes) all the dishes he would like me to make at some point. Needless to say, there are lots of sticky notes! For his birthday, I made him what we called our “Mediterranean Feast” and prepared five or six different dishes from this book…so it’s one of my few cookbooks that I’ve actually made something from its recipes! The feast was a big success and Aaron loved everything that I made…so big points for this cookbook. From an actual cooking standpoint, I found the recipes very easy to follow (all of the recipes are illustrated with several photographs) and pretty adaptable too. As already mentioned, this is another British cookbook, so learning some British food and cooking terms would be helpful. I’ve always loved cookbooks. From my first one (Sunset Best Kids Cook Book…which I still have and is one of Cedar’s favourite books to look at), a gift from my parents at the tender age of eight, until now with a collection of over twenty, cookbooks have always been something I’ve enjoyed. Maybe it’s the combination of food and books, but they’ve often been something I could just sit and read for a long time. Because yes, I read cookbooks. As many of you probably guessed from the “recipes” I post on here, I rarely ever actually cook from a written-out recipe. I get an idea and start throwing in whatever sounds good and it usually turns out pretty yummy. As such, cookbooks serve as inspiration for me, and in reading them I can glean little tidbits of info on processes and ingredients that will hopefully continue to improve my cooking overall. Recently I went through my cookbook shelf and got rid of the few that I didn’t like anymore, and added a few courtesy of some birthday money (the “Cookbooks” section of my Amazon wishlist always has something in it!). And in the long process of trying to decide which cookbooks to buy with my birthday money, I thought about cookbooks a lot (ask Aaron how long I obsessed over it…or maybe don’t!). And after I made my decisions and added them to my shelf, I decided that I should blog about my cookbooks since their shelf is one of my favourite parts of our house (I have many). So, in this post and several more to come, I’m planning on going through my cookbooks and telling you a little bit about them and what each have contributed/are contributing to how I cook now. 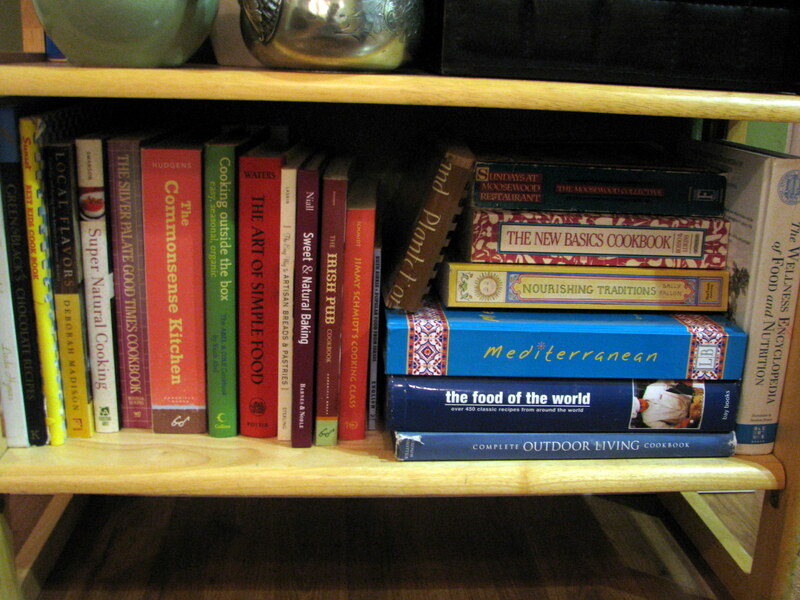 So, without further ado, and in no particular order…my cookbooks! The Art of Simple Food: Notes, Lessons, and Recipes from a Delicious Revolution – by Alice Waters: If I had to choose just one cookbook to have for the rest of my life (other than my massive black binder full of recipes I’ve collected over the years), this would be it. Aaron gave it to me for my birthday the first year we were married, but that’s not the only reason I love it. Compared to many of my other cookbooks, it doesn’t really have a lot of recipes, but it makes up for it in the notes and lessons. From this book, I learned how to roast a chicken properly. But it didn’t just show me how to roast it for their particular recipe for roast chicken, it taught me how to roast one in general so then I can take that knowledge and expand on it and come up with all sorts of delicious possibilities. And all the recipes are like that. The book is divided into two parts: first are the seventeen chapters of “Lessons and Foundation Recipes” and then part two contains more recipes that build and expand on the ones from the first part. Definitely a cookbook I would recommend to anyone, regardless of their cooking expertise and ability. The Commonsense Kitchen: 500 Recipes + Lessons for a Hand-Crafted Life – by Tom Hudgens: This is one of my recent acquisitions and my current read. And even though I haven’t even finished it yet, I put it right up there with The Art of Simple Food. Another of those cookbooks with lessons along with the recipes, in this first reading I’ve already learned many different things that can help my cooking even if I never cook specifically from this book. I think I’ll be using this book often…several the recipes I read last night made me anxious for things to start to cool down so I can cook and bake more. Also similar to The Art of Simple Food, this cookbook doesn’t contain any photos, but you don’t find yourself missing them since there’s so much good info in what you read. Local Flavors: Cooking and Eating from America’s Famers’ Markets – by Deborah Madison: This one was a thank-you gift from one of Aaron’s brothers for helping him with a meal he was catering and I’m so thankful he picked it out for me. While I haven’t ever actually cooked anything from it, I’m often inspired by the myriad ways she prepares vegetables…and all the different combinations too! And I’ll admit, sometimes I just page through it to look at the pictures…the photography of the vegetables and the farmers’ markets they came from are just beautiful. And sprinkled throughout the book are little essays on the different farmers’ markets that she’s visited around the country, very fun to read. Green and Black’s Chocolate Recipes – by Caroline Jeremy: It’s no secret that Green & Black’s is my absolute favourite brand of chocolate (we even had them for favours at our wedding!). And so I was very excited when one of my best friends gave me this cookbook for Christmas several years ago. I haven’t actually made anything in it yet (mostly because any Green & Black’s chocolate I have gets eaten quickly and not cooked with! ), but all the different ways they use chocolate are delicious to see. And throughout the book is information on how cacao is grown and Green & Black’s chocolate is made (it’s fair-trade). A book that will definitely make you drool and then go and eat a handful of chocolate chips!